How many different methods have you heard of when it comes to how to sight in a scope? Probably a lot, just as we have. There are a lot of opinions on how to sight in a scope, but there are a lot of different needs for sighting in that scope. Some folks want to punch paper, some folks want to know how to sight in a scope for hunting, and some folks need to know how to sight in a scope for tactical use. We’re somewhere in the middle with our approach to how to sight in a scope. 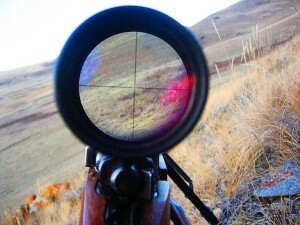 We don’t shoot in the benchrest or tactical disciplines, but we have fairly demanding needs for high degrees of accuracy and repeatability for things like varmint hunting and longer range big game hunting so we need a good, logical routine for how to sight in a scope for our purposes. First, we generally use a paper target at a rifle/pistol range along with a chronograph to gather some ballistics information to help us as we’re deciding on where we want our bullets to impact the target. Due to our extensive experience with chronographs, we’re partial to both the CED M2 chronograph and the Shooting Chrony Beta chronograph based on their quality, ease of use, flexibility and reasonable prices. Both of our CED M2 chronographs live in CED carrying cases because we like how everything fits perfectly and is protected by the heavy duty, yet reasonably-priced nylon case – our Shooting Chrony Beta has its own factory case as well and is very compact and dependable. A chronograph is something you’ll want to take good care of to maintain top measurement accuracy. We’ve also used other chronographs successfully and if you use another brand, we’re OK with that. The idea is to get velocity information that is statistically repeatable to help you decide best how to sight in a best rifle scope properly for your personal use. We highly suggest that you don’t guess on your ammunition’s velocity due to variations in firearms and ammunition. It’s highly unlikely that even if Fedremchester 30-06 180 grain, soft-point spitzer ammunition says on the box it should deliver 2,820 fps when fired that it will actually produce that velocity in your firearm. Be smart, be safe, be knowledgeable and use a good chronograph to know more precisely what your actual average velocities are. Keep in mind that ammunition may be affected by temperature variations and that it may produce vastly different velocities when exposed to different temperature extremes in the field (i.e., winter cold and summer heat). Handloaders and users of custom-loaded ammunition should be particularly careful of possible dangerous ammunition pressures and pressure spikes when firing ammunition in the heat of spring and/or summer temperatures that was considered safe in the cool fall or cold winter temperatures when a firearm was actually sighted in. Handloading and reloading are separate major subjects and we suggest that you seek expert advice in those areas from qualified, expert sources and references. We recommend that (for general hunting and shooting) you shoot no less than 20 rounds of the same ammunition and we heartily recommend that you shoot at least 40 rounds of the same ammunition across your chronograph’s sky screens at a consistent distance of 12-15 feet to get a solid idea of how that particular ammunition will perform velocity-wise. Later, we’ll take a closer look at the accuracy of the ammunition as we examine the process of how to sight in a scope. It goes without saying that any scope should always (and ONLY) be sighted in for its intended purpose with the ammunition that you will be using for that specific hunt, for that particular match or even for a given tactical purpose which may be ongoing. This applies whether you’re shooting factory ammunition, custom ammunition or handloaded ammunition. If you’re shooting factory or custom-loaded ammunition, try to ensure that you have the same lot numbers on your ammunition boxes or containers for consistency. You handloaders out there should always record your loads faithfully on the ammunition boxes or containers so you’ll know exactly what ammunition you’re shooting. Again, seek expert and qualified advice for further information. There are many free ballistic resources on the internet that you can use to help develop a suitable ballistic table for your rifle or pistol and the scope you want to sight in. You can just type “freeware ballistics software” into your favorite browser to get started finding a suitable program. We use NECO QuickLoad© and don’t mind giving that product a plug because we have depended on it so long. It’s not cheap, but it does what we need it to do and it works well on our laptop when we’re at the range. There are many free online resources available in the area of ballistics calculators and ballistics tables. Now that you’ve set up your chronograph it gets easier. We recommend using a bore-sighter if you have access to one to save a few cartridges at the range. If you don’t have one, set up your sight-in target at 25 yards to start with and begin your sight-in process from there. If you don’t have a laptop computer to take to the range then you can print several ballistics tables in advance to take with you. Check several reloading manuals or online sources to determine what your range of bullet velocities is likely to be. As an example, say you want to know how to sight in a scope on your Savage Model 116 in .223 Remington. You check both online and in several current reloading manuals you have available and determine that the load you will be using could produce from 2,900 fps to 3,400 fps. Knowing the information above, you can easily and quickly print out 6 ballistic tables if you only want to use even 100 fps increments (i.e., 2,900, 3,000, 3,100, etc.). . .or 12 ballistic tables if you want to use 50 fps increments (i.e., 2,900, 2,950, 3,000, 3,050, etc.). Simply determine the average velocities of your cartridges from your chronograph information and choose the ballistics table that most closely matches your ammunition’s velocities. An alternative to this method is to use two separate trips to the range, the first to develop velocity information with your chronograph and to get your bullets onto the paper target, and the second trip to actually adjust your scope to place your fired groups exactly where you want them to be at the appropriate distance after you have determined the correct ballistic table to use (i.e., 100 yards, 150 yards, 200 yards, etc.). 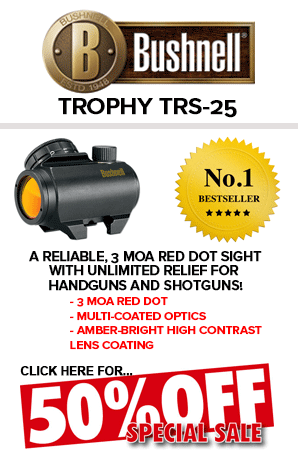 Now, for the actual shooting portion of the process and the easy way to sight in your firearm with the fewest shots. Let’s assume that you are shooting at 25 yards at a standard ten-ring target. Since you used a bore-scope, you are at least on the paper but although you aimed correctly at the target center with your cross-hair reticle, the bullet struck the target 3 inches to the right and 2 inches high. At this point, do not chamber another round yet and place your firearm in as close to its original firing position as possible and place the cross-hair exactly on the target center just as you did before and hold the rifle as steady as possible (it helps to have a friend or fellow shooter help you hold the firearm immobile here). With the cross-hair remaining exactly centered on the target to start with, just as you did with the first shot and with the rifle remaining immobile, begin to move the scope adjustments so that the intersection of the cross-hairs moves exactly on top of the first bullet hole (the gun must remain immobile during this process). Now, you may fire your second shot – this is how to sight in a scope with very few shots required at a given range. Aim by placing the cross-hairs exactly on the target center as you did with your first shot, but now your second bullet should come very close to, if not exactly impacting, the center of the target. This assumes that you kept the firearm completely immobilized in the position that it was in while you sighted on the center of the target before you began to adjust the cross-hairs to intersect with the first bullet hole. This may sound a little complex, but in practice it takes only a few seconds, particularly if you have a good assistant to help you hold the firearm still during the reticle adjustment after the first shot. After you try it a time or two, you’ll be giving lessons at the range. . .heck, you might even make a little money. . .or not! At this point, you should find it very easy to extend your target to either 50 or 100 yards to further fine-tune and adjust your scope to place your fired groups just about anywhere you like. We always prefer 5-shot groups for consistency and we always like to shoot at least 5 groups of 5 shots for maximum confidence in our sighting procedure.